Posted On Mon, 27 Nov 2006 19:07:00 +0000. Filed in running. By Vaibhav Bhandari. SeattleHalfMarathon-Vaibhav Originally uploaded by vbha. Well yesterday my human soul was able to achieve the feat of finishing the seattle half marathon, under pretty harsh rain, wind and snow:). I completed the 13.2 miles in 2 hours 26 minutes chip time and 2 hours 30 minutes and 18 seconds official time!! I was amazed that i didnt break any of leg parts!! and actually i was delighted that i could achieve my personal time goal of 2hours 30minutes!!! I started the run at 7:30am with a pretty jovial bunch of folks who were upbeat even though it has just snowed (!!) a few minutes before. 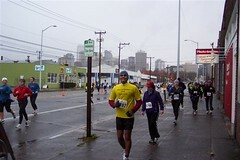 I finished the run at 10:00am braving the constant downpour and winds. At point I was little worried if i could finish the half marthon with my time goal as i was already timing 1:19, but then i paced myself a little faster, I walked hills, ran hard on downhills :) and steadied out the flats taking about 1:17 to finished the rest of half!! And yep, i felt strong and wasnt limping as i has imagined i would!! May be it was one of the great days!!! Now…comes the fun party yep! today i’m feeling pretty soar :)..well its not as bad as i felt after my first STP though. But i’ll wait until tomorrow to say anything for sure because it seems the worst hit is two days after the marathon!! Along with me several Asha runners completed the run!! Way to go Miles For Smiles !! !